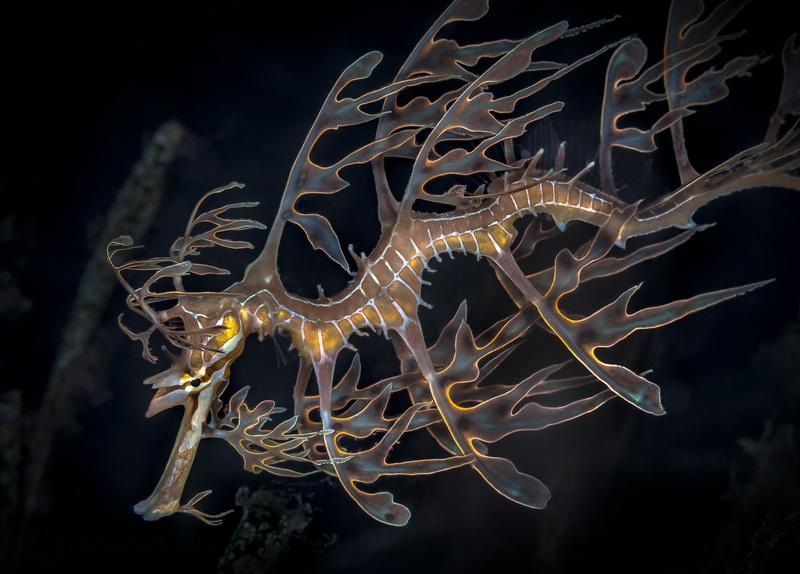 Three weeks ago on an Edithburgh night dive I found a tiny little leafy seadragon less than two inches long that took my breath away. It was that beautiful red translucent colour of a juvenile probably only a month or so old. This dive I was in for a wonderful treat. I found my not so tiny dragon again, not right next to the jetty but some distance off in the sea grass. Wow had it grown in just three weeks. Now it had nearly doubled in size and was beginning that red to yellow body colour transition. Its appendages were growing and becoming more complex and its markings becoming more pronounced. Seeing this beautiful golden dragon a second time as it grows has inspired me to make another trip to Edithburgh to hopefully find it again and capture its change into a fully mature leafy.